As summery weather made a fleeting appearance in Glasgow, it was fitting to be watching a play set on the Nile as the inside of the theatre reflected the warmth of the setting perfectly. The handkerchiefs clutched by the actors for dramatic effect would have been gratefully borrowed by the rapt audience as the temperature climbed and the tension on stage reached its crescendo. 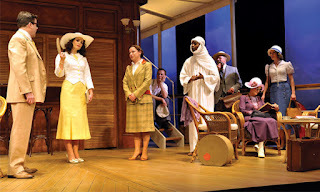 Based on Agatha Christie's book, Death on the Nile, the play takes place during a paddleboat journey but sadly it does not feature her most famous character Hercule Poirot, as the book does.It is a credit to the strength of Agatha Christie's writing that this play stands the test of time. There is an overwhelming availability of criminal activity focused programming on TV these days and yet this play had more twists than an episode of CSI with the characters appearing shiftier and shiftier as the action progressed. CSI: Miami's Horatio Caine would have been quite at home on the deck of the paddleboat that dominates the stage twirling his Ray Bans and waiting for the murderer to crack under the pressure. What makes this play compelling is that up until the very last scenes it is impossible to predict whodunnit from this mismatched collection of people who find themselves on the Nile together. Kate O’Mara is scene stealing as the formidable Miss ffoliot-ffoulkes and Max Hutchinson is the perfect foil as William Smith. Smith’s one-liners and casual wit provide much needed light relief from the tension on stage. O’Mara’s interpretation of brandy-addled ffoliot-ffoulkes is particularly entertaining. 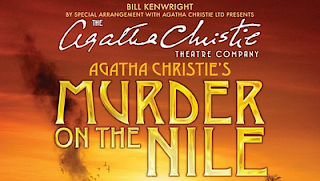 The strong performances from the whole cast and the glorious lack of technical wizardry revealing by DNA who the murderer is ensure the attention of the audience as they try to unravel the mystery. 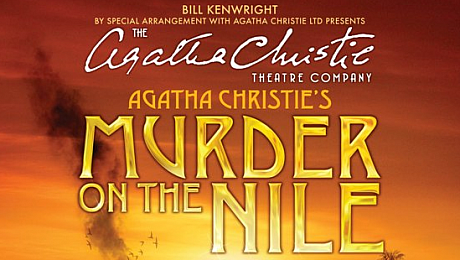 For a trip to the by-gone era of travel and fans of a traditional murder-mystery a night on the Nile is just the ticket.